My mother, Betsy Bang, loved folk tales, and they were the best way she found of learning a new language. 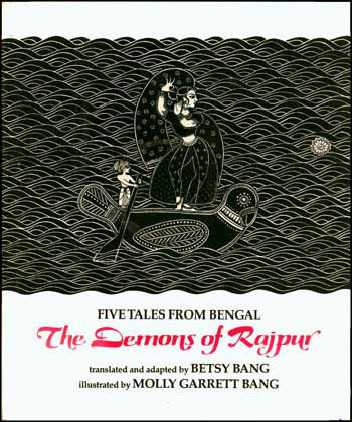 So when I needed a project to illustrate, she translated a few of the most well known Indian folktales from Bengali so I could illustrate them. The stories are full of blood and gore and scary monsters and beautiful princesses and nasty stepmothers and adventures. Why did I illustrate them in this particular way? I looked at many, many illustrations from India, and at that time, among all of them I loved the religious paintings by the women of Mithila the best, so that is the style I tried to imitate. As the women paint, they meditate on the god or goddess they are representing, and they become completely absorbed so they forget everything else. I tried to do this, but I found that the style changed. I made myself focus as much as I could, like the Mithila women, but I used very smooth paper and a very fine brush, and the lines began to get slightly fatter or thinner as I painted them, so it became a bit like dancing. These are among my very favorite pictures.